Stephen Gabor always brings his work home with him. But don’t feel bad for Stephen: Office and residence are just a courtyard apart, separated by the most recent result of his labors — a gorgeous garden bursting with cannas and foxtail ferns, and the calming ambient noise of a koi pond. 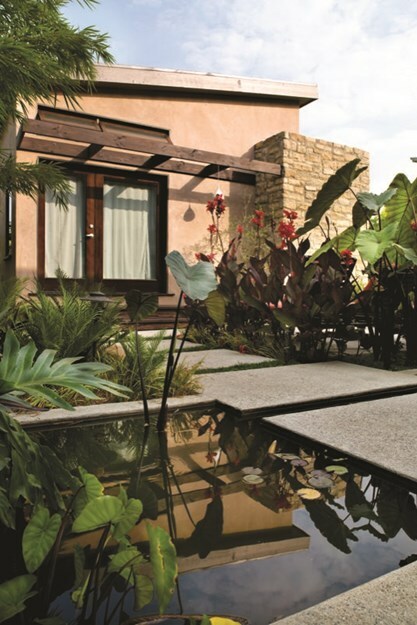 Silver lady ferns, a black-stemmed form of taro and hybrid coral-flowered cannas line a path of exposed aggregate concrete steppingstones that leads from Stephen Gabor’s home, past a tranquil pool, to his office, which he shares with Patrick Allen of design-build firm Gabor + Allen. Photo by: David Young-Wolff. Trained as an architect at cutting-edge SCI-ARC (Southern California Institute of Architecture) in Los Angeles (as was business partner Patrick Allen), Gabor purchased this property in Venice, California, back in 2004, which he shares with his wife and their young daughter. In an act of near blasphemy for car-addicted Los Angeles, he opted to tear down the home’s two-car garage and convert it into an office for his newly formed design-build and landscape practice, Gabor + Allen. The yard located between home and office does double duty as family space and a showcase for prospective clients. It’s also, literally, fertile ground for the partners’ design ideas: Gabor and Allen enthusiastically refer to it as their laboratory. Gabor knew he wanted a flexible space for alfresco dining, an outdoor living room with a fire pit, and a water element. He also hoped to find a way to better connect the home’s master bedroom to the garden (a goal achieved through the design of a unique space-saving system, incorporating one half-French/one half-pocket door) as well as a smart way to direct visitors from the street to the office. California garden mythology might suggest stately palms or verdant lawns, but the truth is that most of those quintessential palms aren’t indigenous, and the era of the high-maintenance blanket of grass has passed. “The modern California garden is a conglomerate,” says Gabor, a claim he proves in his own — a vibrant mix of colors, textures, cultures, species and shapes, not to mention edibles. The dining table, made by Gabor from old wooden fencing planks, does double duty for working lunches and family gatherings. Photo by: David Young-Wolff. Since he was designing for himself, Gabor was able to sidestep some of the typical client constraints, but whether he and Allen are working for clients or for themselves, he explains that “it’s not our way or the highway. Architects have a reputation for being inflexible, but we have no trouble interspersing our modern aesthetic with a Tudor house. You don’t have to commit to just a cactus garden or just a rose garden.” And the firm’s work illustrates just how well an eclectic blend of styles and philosophies can merge. Gabor’s personal project not only expands the definition of the California garden, it also offers a primer into much of the current thinking on green landscapes. 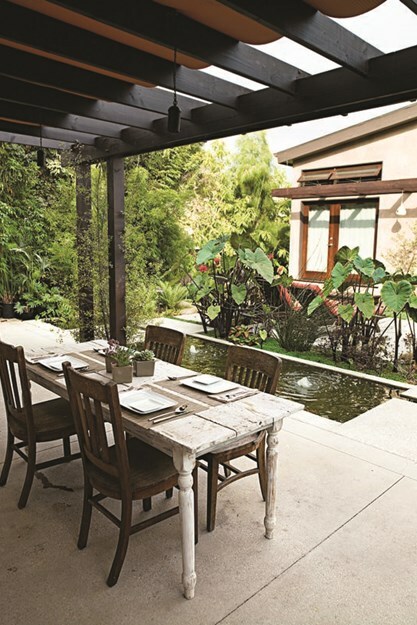 Most of Gabor + Allen’s clients are on the west side of Los Angeles, particularly Santa Monica and Venice, where sustainable, drought-tolerant landscaping is no longer just an eco-trend. Santa Monica in particular has adopted increasingly rigorous restrictions on water usage and plant selection. The city has a no-water-waste ordinance that prohibits runoff and overspray onto impermeable hardscapes, and to approve any new construction, the city reviews and then requires an on-site inspection of plants, irrigation systems and grading. But far from deterring the pair’s creativity, Gabor and Allen are both of the belief that these initially challenging constraints end up enriching their projects. 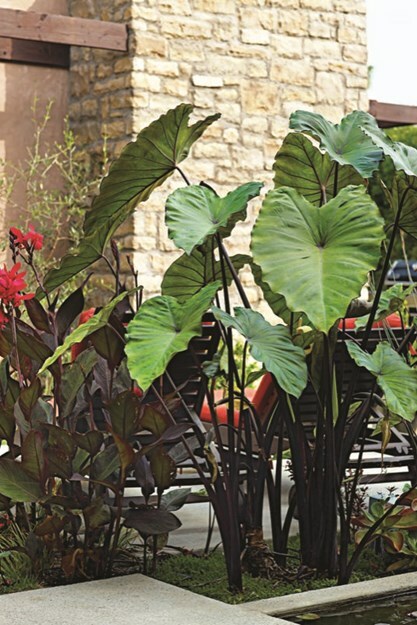 Bold clumps of Colocasia esculenta ‘Fontanesii’ (black taro) help divide the small garden into separate spaces. Photo by: David Young-Wolff. In the outdoor living room, Gabor + Allen’s distinctive fire table made from natural stone emerges from a groundcover of Sedum anglicum. Photo by: David Young-Wolff. Concrete divides Gabor’s own space into different quadrants, while grass strips determine the circulation from street to garage and garage to house. Fanned-finish concrete extends from the office; steppingstones were made of a rougher-texture exposed aggregate concrete. Benches and planters were also formed from the oft under-appreciated material. Hardscape of course, helps to reduce water use, perhaps the most pressing challenge for gardeners. Gabor opted for the unexpected option of hand watering, arguing that he is able to water certain parts of his garden less frequently and can saturate the soil in other parts. There are also plans to incorporate rain barrels, one of several storm-water management systems increasingly being encouraged through local and state incentives, grants and educational programs. 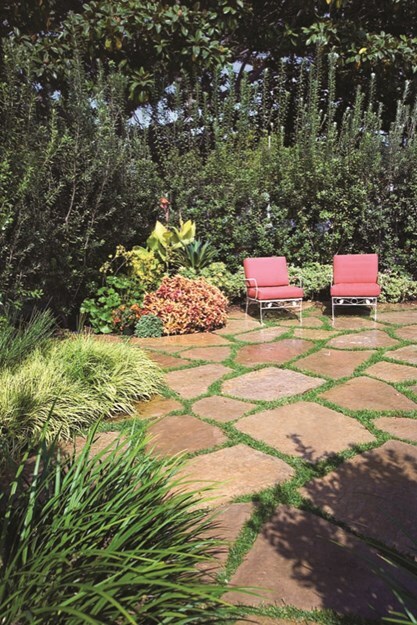 In the front garden (which used to be a lawn), curvilinear planting beds frame the perimeter of the permeable hardscaped patio with a bright palette of lime green, yellows and oranges. The chairs were a Santa Monica Airport flea market find, reupholstered with new coral Sunbrella fabric cushions. Plants include Acorus gramineus ‘Ogon’ (Japanese sweet flag), Agave desmetiana and Farfugium japonicum ‘Aureomaculatum’(leopard plant). Photo by: David Young-Wolff. Another move toward a more sustainable garden can be seen in the integration of edibles. “Robert Smaus, the former garden editor for the Los Angeles Times, once wrote that every garden in southern California should have a lemon tree,” says Gabor. “We love to incorporate citrus.” Though Gabor is less interested in creating a designated vegetable garden than in interspersing edibles throughout the garden, whether herbs like thyme, chives and oregano, or vegetables like tomatoes, peas and green beans. And for clients with kids and for his own family, Gabor likes to plant strawberries near footpaths to provide flowers, abundant fruit and easy picking. Such kid-friendly ideas figure prominently into Gabor + Allen’s designs. “Children have been a major player in the work we do,” explains Allen. “The space we design is never just for adults; we’ll always include areas of discovery for children, some little surprise to stumble upon. Kids love it.” And arguably, they lead to some of the most “green” interventions; instilling an early appreciation for the landscape — and the planet — is key to a greener future. Mowing Woes: Want to exchange your lawn for a more sustainable alternative? First, make sure you can: Many cities and towns have lawn-mowing ordinances to deter people from failing to maintain their green space. Violators often face stiff fines. But as water shortages and increases in water price are here to stay, this will start to change. Let this empower you to take up the issue with your homeowners association or local government. City Water: Changes are afoot nationwide: In Southern California, where water shortages are becoming a way of life, decisive action has been taken by the Los Angeles County Board of Supervisors to require waterwise irrigation and exclusive drought-tolerant plantings. Even if your city or town lacks this rigorous program, consider following its mandate for the good of the planet. Grass is Past: Educate yourself. A new 2nd edition of Fritz Haeg’s Edible Estates: Attack on the Front Lawn has been published by Metropolis Books (Spring 2010). Be inspired by the eight edible gardens featured in the book as well as the Good Food Revolution manifesto from Growing Power’s Will Allen. Look for opportunities like garden expert Nan Sterman’s “Bye Bye Grass!” class which teaches attendees how to get rid of their grass and what to plant instead.